Of course many of you will know the answer, some of you won’t & some of you will be surprised by the answer. Malabou specialises in making castings in stainless, alloy, mild, and tool steels and we are often asked this question. At room temperature, Mild Steel is magnetic – the atoms are arranged to form a structure that is predominantly ferrite. Ferrite is magnetic. Once steel is heated to above 730°C the atoms will tend to rearrange into a phase called Austenite. 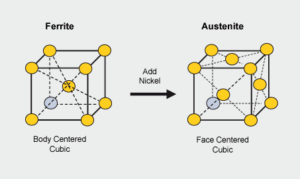 Austenite is non-magnetic. So very hot steel is not magnetic…. who cares! An interesting fact is that some alloy additions will encourage Austenite to be stable at room temperature, the result being a steel which is non-magnetic at room temperature. One such element is Nickel. The 300 series of stainless steels contain sufficient Nickel to render them non-magnetic. As 316/L & 304/L are the most common stainless steel grades used, they are the grades that most people are familiar with. All the stainless steels from the 300 series are non-magnetic. This has resulted in the misconception that all stainless steels are non-magnetic. But the fact remains that stainless steels from the other series such as 400, PH, duplex etc have higher percentages of ferrite and are therefore magnetic. Some of these “magnetic” stainless steels have superior strength and corrosion resistance than those of the 300 series. It is normal for your “316 equivalent” casting to exhibit some magnetic properties. Castings said to be from the 300 series (e.g. a casting specified as 316) can be, and most often is, at least slightly magnetic. The reason for this is that 316 is a designation for a hot rolled or forged stainless steel, it is known as a “wrought” designation. The equivalent casting specification is CF-8M, which is similar but not identical in composition and properties of the wrought grade. The wrought grade has its chemistry optimised so that it is fully austenitic, this is an advantage for a wrought (worked) grade as the austenitic microstructure requires less energy to squeeze or roll the material into shape. This is not an advantage for a casting as it does not have to be squeezed into shape. A casting forms its shape by the solidification of the liquid metal into the shape of the mould it is contained in. A CF-8M casting has its chemistry balanced so that it is predominantly austenite with usually 5 to 15 % ferrite. This is done to enhance hot strength and reduce the possibility of complex cast shapes tearing as they cool in the mould. Since the casting is not going to be rolled, the increased hot strength doesn’t cause any inconvenience. However, the presence of some ferrite renders the casting slightly magnetic. Although the chemistries and microstructures vary between the wrought and cast grades, the physical and corrosion properties are closely matched. The hot rolling imparts some strength to the wrought grade and this is countered by the ferrite phase which imparts additional strength to the cast grade, the hot rolling imparts a good corrosion resistance to the wrought grade by refining the structure and this is countered by the increased corrosion resistance in the cast grade by slightly higher chromium content. Now that you understand some of the metallurgical factors, you can accept that it is normal for your “316 equivalent” casting to exhibit some magnetic properties.